Incredible. Looking here http://en.wikipedia.org/wiki/Venera noticed that probes lasted at most 2 hours on the surface. Also interesting how Mars landers go for years and on Venus we lasted at most 2 hours. These landings have one of my favourite ever engineering failures, regarding Venera 14. Venera 13 and 14 were twin landers which landed at the same time on Venus. Both contained a similar science package - including an arm to measure the compressibility of the soil on the surface of Venus. Venera 13's arm functioned properly. 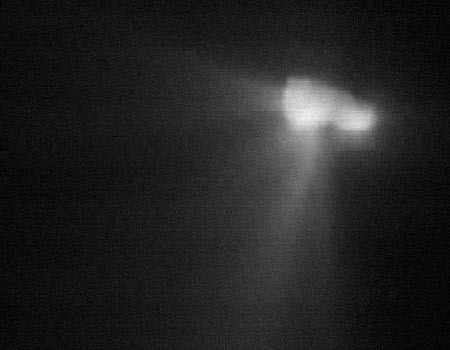 Venera 14's returned strange data, which was soon traced to a very simple fault - both Venera landers had a lens cap protecting their sensitive camera equipment on descent. These popped off on landing, and then the spring-loaded instrument arm extended to perform its testing. Venera 13's arm extended into the soil correctly. Venera 14's arm extended directly into its discarded lens cap. Poor Venera 14 travelled millions of kilometers to test the compressibility of a lens cap on the surface of venus. Venera 14 did also function for almost twice its design lifetime (~57 minutes) so it was a good little probe, but I love to use this little example when talking about reliability engineering. The more important soil-drill/analysis experiment was fine, that is often confused with the soil punch experiment. The paper claims that the Venera-14 punch was OK, the arm went over the lens cap, but the punch still penetrated the soil. Thank you for the clarification. I think it's still a great cautionary tale. 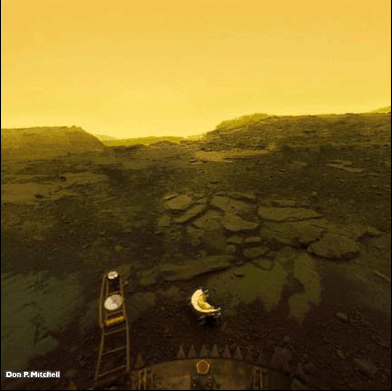 "Poor Venera 14 travelled millions of kilometers to test the compressibility of a lens cap on the surface of venus." I'm taking note of that. This can be a meme! It's astonishing to me that they lasted that long and transmitted data back, considering the operating temperatures and pressures. Pretty amazing their lunar 'robots' Lunokhud, survived for 11 months on the moon (well one did) - lots of interesting photos, but I've not been able to find any video they sent back. Is there really a point in taking video on the moon if there are no people there? What are you going to see, a moonquake? Meteorite? They sent back video as they were remote controlling their robots, using video sent back at a decent resolution and lower frame rate, or low resolution and high frame rate. They needed this to ensure the robots did not get stuck, and because they couldn't build a robot that could automatically navigate for the length of time they hoped the mission would last (3 months). It just seems amazing that this footage was sent back, but not recorded. I presume it was filmed (in much the same way that the US lunar video was captured on film, from video sent back to earth), but that it has not yet been released, or was lost or otherwise destroyed. To me it feels like this would be very exciting footage to see - the first footage ever sent back from a robot on another celestial body. The video would also have been important for helping scientists understand the make up of the moon. Remember these missions were from when the Soviet Union had only been able to return 109g of lunar samples to earth. Not the 50kg the USA had from two manned missions. This blew my mind. 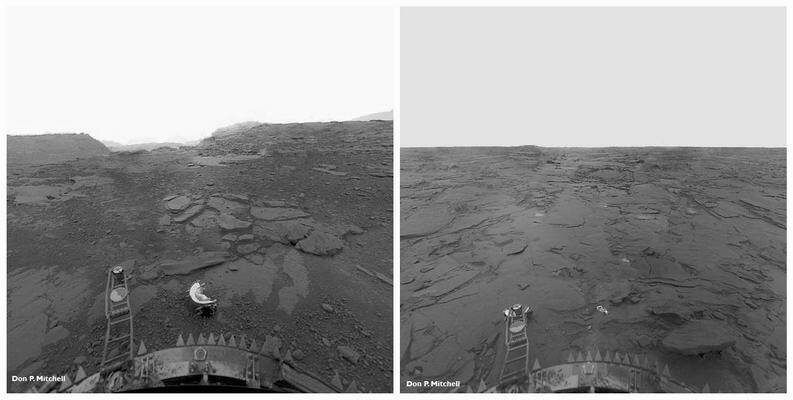 I had no idea we ever landed anything on Venus, let alone something that was able to send us pictures from the surface. Fantastic images! This was in the 80s, during the Cold War. As such, it's not really surprising that most people (especially Americans) have not heard about it. It is a Soviet accomplishment after all. This was covered extensively in the New York Times, not to mention lots of science magazines. It was so well known that the TV show "The Six Million Dollar Man" had a multi-episode plot arc on the topic. Oh please, yourself. From the abstracts, several of those New York Times articles you linked to are actually about US probes. Those that report on Soviet activities appear to mostly be about the failed missions from the 1960s, as opposed to the 1975 and 1981 missions discussed by the OP. > A suite of instruments more sensitive than those on Mariner 2, in particular its radio occultation experiment, returned data on the composition, pressure and density of the Venusian atmosphere. The joint Venera 4 – Mariner 5 data were analyzed by a combined Soviet-American science team in a series of colloquia over the following year, in an early example of space cooperation. Yeah, but how much was the coverage compared to, say, the Lunar Landing? How many movies were made about it, books written about it, conspiracy theories created about it, etc. One involved getting people on the Moon. That is a significant difference. You can bet your skippy that if ever someone steps foot on Mars, there will be books, conspiracies, movies, etc. Not much. And you're asking the wrong generation about the '69-'72 lunar landings. Coverage was there, for those who were interested in finding it. The Soviets' failures were, of course, highlighted, but their accomplishments weren't downplayed, either. I like it, looks like Robby the Robots great great grandfather in some ways I suspect. Also looks like something not totaly out of the reach of home ameteurs thesedays, prohibited parts and materials aside though. Now HERE is what I consider really cool: in the US we were seriously thinking about taking some Apollo components, building what amounts to a Skylab with thrusters, and doing a MANNED Venus flyby in 1973. It's a cool idea, but it probably would have killed the crew due to radiation exposure. Edit: Some additional info. The Apollo crews had very little radiation protection, basically just the hulls of their spacecraft. This was thick enough to give them protection against the van allen belts as they zipped through them (not coincidentally where the ships were going near their highest speeds) but it wasn't enough to protect against an errant solar flare. Fortunately, the missions were short duration and we just plain got lucky. Venturing into the inner Solar System near Venus would have exposed crews to higher levels of radiation (due to proximity to the Sun) and combined with the longer duration trip would have virtually guaranteed being exposed to high doses from a CME or solar flare. No, no one was really considering it. It was commissioned by NASA to a small contractor team just as a thought experiment and as a theoretical demonstration of Saturn V capabilities, with no intention of going through with it. The Soviet TMK was even more interesting: http://en.wikipedia.org/wiki/TMK - a planned 3 year mission. There is also info about this on the site linked to in the parent. Thanks for the comments. I'm working on a book now. Also was invited to write a paper refuting the claim of living creatures in the Venera photos. Those features are explained by unusual pulse-position modulation system. Every few years these photos cross my path and every time I'm just as captivated as when I saw them as a kid. The further we get from that era, the more remarkable the accomplishment feels. I learned about it some time ago in another HN thread, but the BBC series The Planets gives great, concise looks at much of the interplanetary research efforts by the US and the USSR. There are some bits of information that are no longer understood as true, and the series lacks some recent information since it was produced in the late 90s, but it really is worth watching. It's an eight-part series (each episode being about 45 minutes), and the first three episodes were especially remarkable for the descriptions of what scientists have accomplished, the interviews with some key people, and the film/images shown. I can watch those over and over, and each time I'm struck by how amazing it is that people have accomplished things like this. To me, there's a wonder in it all, from the fact that there have been these achievements and that I've lived at a time to bear witness. I know it's listed on Amazon and through Netflix for anyone who is interested. My thanks go to whomever it was around here who informed me that this series exists. It's a shame the other terrestrial planets are so uninhabitable. >Despite the harsh conditions on the surface, the atmospheric pressure and temperature at about 50 km to 65 km above the surface of the planet is nearly the same as that of the Earth, making its upper atmosphere the most Earth-like area in the Solar System, even more so than the surface of Mars. Due to the similarity in pressure and temperature and the fact that breathable air (21% oxygen, 78% nitrogen) is a lifting gas on Venus in the same way that helium is a lifting gas on Earth, the upper atmosphere has been proposed as a location for both exploration and colonization. On the surface at least. If there are indeed frozen over oceans on the moons of the outer planets this could be one of the best places for habitation eventually. It won't be very familiar to us but we know how to build things that can survive under water at intense pressures. A thick layer of ice helps with the radiation and in the case of a liquid water oceans we know it will be a fairly comfortable place to live. With the right technology we could probably live underground on many moons and planets. The tricky part would be making them self-sustainable which isn't even a deal breaker if you can direct an icy asteroid to the right spot on the surface and do something useful with it afterwards. As a species we're even preparing ourselves for living under the surface. Many of us sit inside buildings the vast majority of our lives. Psychologically I think it wouldn't be a huge leap. The biggest problem we can't even speculate much about solving is gravity. Even if it's not too extreme the effects are pretty rough on the body. I've thought about this, your example and also moon or mars bases. While theoretically possible, the thought of trying to do major underground construction (with limited resources) in a space suit seems wildly impractical. Here is a look at the polar vortex on Venus -- it's like looking into hell! nasa.gov? I think anything from the U.S. government is public domain by default. You've pasted this link in every Mars thread. And submitted it on its own. Multiple times. I had a look at your submission list out of curiosity and all your submissions are just self-promotion. I don't think that's in the spirit of HN. Best self-promotion you can do is make quality posts and submissions and then link to your blog from your profile page instead. Hi Halit, I'm not sure non-English content are welcomed on HN. Downvoted, sorry. * It has to be the original source of the new. * There has to be no official English translation available. * It has to be interesting :). You're downoting a link to some awesome images because it's a non-English site? Downvoted, sorry.